Tolerances: Diameter +.125"/-.000"; Thickness +.030"/-.000"
If you have any questions about this product by Macor, contact us by completing and submitting the form below. If you are looking for a specif part number, please include it with your message. 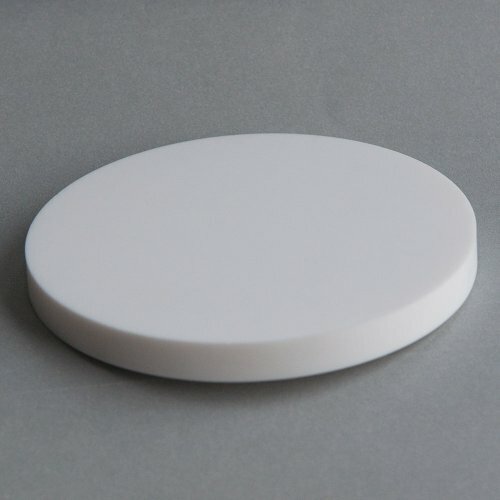 Macor, MAC2-071212, Machinable Ceramic Sheet, 7/16" Thick X 12" X 12"
Macor, MAC2-081212, Machinable Ceramic Sheet, 1/2" Thick X 12" X 12"
Macor, MAC2-091212, Machinable Ceramic Sheet, 9/16" Thick X 12" X 12"
Macor, MAC2-041212, Machinable Ceramic Sheet, 1/4" Thick X 12" X 12"
Macor, MAC2-090612, Machinable Ceramic Sheet, 9/16" Thick X 6" X 12"
Macor, MAC2-120612, Machinable Ceramic Sheet, 3/4" Thick X 6" X 12"
Macor, MAC2-061212, Machinable Ceramic Sheet, 3/8" Thick X 12" X 12"
Macor, MAC2-100612, Machinable Ceramic Sheet, 5/8" Thick X 6" X 12"